DENVER--(BUSINESS WIRE)--Integrated Beverage Group (IBG) announces the nationwide launch of Replica® wines, unlocking the essence of consumers’ favorite wines for between 25-50 percent less. Using sophisticated science and proprietary, patent-pending methodology, IBG has analyzed the taste and aroma profiles of thousands of wines over the past four years. The data gained and the artisanal skills of its team of award-winning winemakers were then harnessed to reverse engineer today’s most popular wines, creating Replica. IBG has partnered with Ellipse Analytics, an independent, ISO 17025 accredited analytical chemistry laboratory, to compile what could be the world’s largest database of taste and aroma information relating to wines and other alcoholic beverages. The lab, equipped with state-of-the-art instrumentation, identifies more than 50 specific flavor and aroma profiles in each wine. The company’s winemakers use this data – and classic blending techniques – to create wines that taste virtually identical to popular national brands, but retail for as much as half off. 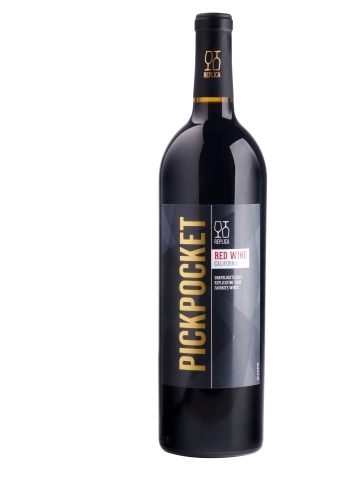 Pickpocket Red Blend, retailing for less than $25: Compare to The Prisoner® red blend, but at approximately 40 percent less than the prevailing retail price, depending upon the market. Misbehaved Pinot Noir, retailing for less than $16: Compare to Meiomi Pinot Noir®, but at approximately 20 percent less than the prevailing retail price, depending upon the market. Knockoff Chardonnay, retailing for less than $11: Compare to Kendall-Jackson Vintner’s Reserve® Chardonnay, but at approximately 20 percent less than the prevailing retail price, depending upon the market. Just Right Cabernet Sauvignon, retailing for less than $13: Compare to Joel Gott 815 Cabernet Sauvignon®, but at approximately 20 percent less than the prevailing retail price, depending upon the market. Embellish Pinot Noir, retailing for less than $15: Compare to Erath Oregon Pinot Noir®, but at approximately 20 percent less than the prevailing retail price, depending upon the market. Retrofit Chardonnay, retailing for less than $25: Compare to Rombauer’s Carneros Chardonnay®, but at approximately 30 percent less than the prevailing retail price, depending upon the market. Label Envy Pinot Noir, retailing for less than $17: Compare to La Crema’s Sonoma Coast Pinot Noir®, but at approximately 20 percent less than the prevailing retail price, depending upon the market. Scapegoat Valle dell’Adige Pinot Grigio, retailing for less than $17: Compare to Santa Margherita Pinot Grigio®, but at approximately 20 percent less than the prevailing retail price, depending upon the market. IBG Chief Wine Officer Brett Zimmerman, Master Sommelier, ensures each Replica wine passes the quality test. As one of only 233 professionals worldwide to have earned the title of Master Sommelier since the first Master Sommelier Diploma Exam nearly 50 years ago, his highly sophisticated and sensitive palette is the wine’s ultimate quality assurance. Using the finest grapes from Napa Valley to Barolo, IBG produces a variety of award-winning wines sold throughout the U.S. and Canada, which also include popular brands Chime®, Cara Mia®, Reaper® and Rascal®. For more information, visit replicawine.com. Integrated Beverage Group delivers extraordinary value to alcoholic beverage consumers, and the entire supply chain, through its disruptive technology, innovative sales and marketing platform and its collection of top, accessible wine brands, including Replica®, Rascal®, Chime®, Cara Mia® and Reaper®. For more information, visit integratedbev.com. Integrated Beverage Group is in no way affiliated with health and wellness product manufacturer, Integrated Beverage Group, Ltd. Replica® is not affiliated with The Prisoner Wine Company, Rombauer, Meiomi, Kendall-Jackson, La Crema, Joel Gott, Erath, Rombauer, or Santa Margherita. Integrated Beverage Group (IBG) announces the nationwide launch of Replica® wines, unlocking the essence of consumers’ favorite wines for 25-50 percent less.